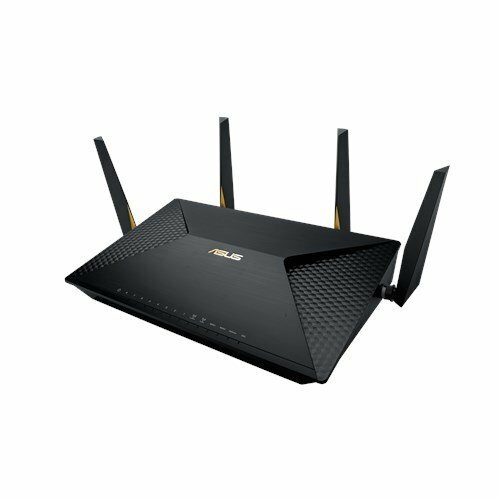 Stable Wi-Fi Range - Fast, stable Wi-Fi throughout your office with 4x4 MIMO antenna design and ASUS AiRadar beamforming. Hardware Dual-WAN - Dual physical WAN ports for ultimate speed and reliability, with up to 2Gbps aggregated bandwidth and failover capability. M.2 Slot for Faster Storage - Internal M.2 SATA slot for ultra-fast networked SSD storage. Easy Management - Grow your business with Captive Portal to set up customer Wi-Fi within steps ; and manage your network with convenient Device Grouping and RADIUS server. Improved Network Safety - Protect sensitive company information with AiProtection, VLAN, and hardware crypto engine IPsec VPN, all without sacrificing working efficiency. Teaming Support - Up to 4Gbps LAN connections. Up to 250 Simultaneous Client Connections - MU-MIMO design and robust connectivity for the most demanding environments.